Tiny House Expedition and general tiny house movement FAQ. A typical tiny house is a home that is designed to be anywhere from 100 to 400 square feet. We believe, tiny houses come in many shapes, sizes and forms (on wheels or on foundation; traditional or modern; stick built, container, converted silo, yurt- you name it!) but they focus on smaller spaces and simplified living. ‘Tiny housers’ are tiny house dwellers. In the US & Canada, they are a small minority of homeowners but are steadily growing in numbers. Tiny housers are an incredibly diverse group including all ages and varied socioeconomic, political and religious backgrounds. Many of these folks might consider themselves one or more of the following: simplicity/freedom-loving, forward thinking, environmentally friendly, creative, quirky, non-traditional, open-minded, financially savvy, self-starters, diy-ers. 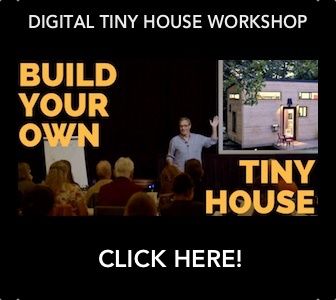 Want to connect with the tiny house tribe? Join or start a local Meetup group. Check out the Tiny House Collaborative's tiny house groups map to find one near you. Plus, join the Tiny House People, The Village Collaborative and the Tiny House Resource 14 Facebook groups. + Tiny House Movement…say what? Simply put, the tiny house movement is a social movement where folks are consciously simplifying their lives and downsizing the space that they live in. People are joining this movement for many reasons; some of the most popular reasons include environmental concerns, financial concerns and seeking more time and freedom. This movement driven by growing number of folks ditching the traditional script of keeping up with the Jones and the more, more, more is better idea, for a life in a simple, small space. The space doesn't define the movement, rather the attitude & lifestyle approach. Less things, more experiences and better quality of life. Learn more by watching our Tiny House Movement & Tiny House Community playlists on YouTube. Tiny houses are low in cost to build & to maintain (as compared to the traditional American home), allowing more financial freedom, less stress, less energy consumption/ reduced carbon footprint, more efficiency and greater connection to your surroundings—nature or community. For some, greatly reduced building costs leads to greater focus on quality materials & building techniques/ craftsmanship. Modern small space design often means efficient design at its best—creative use of space and little to no wasted space. There’s nothing like limitations to spur creativity. Tiny living, in our opinion, is a more sustainable and more tailored living experience; though not right for everyone. For us, tiny houses are an innovative, environmentally and financially sustainable, fill-in-the-gaps housing solution. Tiny housing further broadens the spectrum of quality, affordable housing options in what can be a very limiting housing market. + Why tiny houses on wheels? Mobility, mobility, mobility. What’s not to love about being able to easily haul your home from place to place, as a lifestyle choice or in response to major life changes. Let’s be honest job security is not what it used to be. Family members fall ill. A whole host of reasons can arise that will require you to move; how wonderful to have the freedom and ability to take your house with you. Your moveable tiny home allows you to keep your equity with you. More and more options are becoming available for tiny house on wheels parking BUT not everywhere…yet! Historically, the decision to build on trailer came into being as an attempt to skirt building code restrictions, like minimum square footage restrictions. 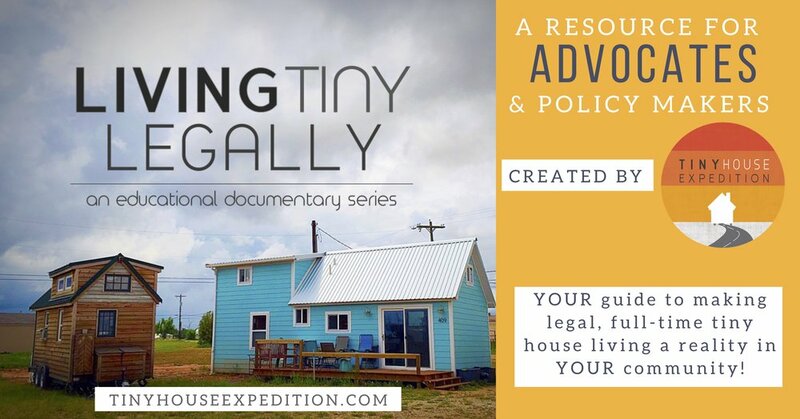 To learn more on legal obstacles that face tiny housing and how these are being overcome in a growing number of cities and model building codes, watch our educational documentary series Living Tiny Legally. + Are tiny houses legal? Yes! And no. Legality of tiny houses from building codes to zoning regulations vary greatly from municipality to municipality. We are adovocating for more safe, quality, legal and attianble tiny and small housing. + What is a tiny house community? A community itself is defined as a group of people living in the same place or having a particular characteristic in common. So simply put the tiny house community at large is group with the shared characteristic of wanting to live tiny. And a tiny house community development would be a group of tiny homes in the same place. From our perspective, a tiny home community could be composed of a variety of small dwellings or a mixture of small and traditional sized homes. There are AS many kinds of tiny home community concepts, AS you can imagine. The sky’s limit! See our video and gallery on tiny home communities and tiny house friendly places. The greater tiny house community, or tiny house tribe, is a tribe in the purest sense—a collection of individuals sharing a common interest. Tiny housers are an incredibly diverse group. Tiny house community means connecting over the common ground of tiny houses, but it's so much more. The house is the launch pad for a more connected, meaningful lifestyle. + How can I start my own tiny house community? Research & collaboration! A good place to start: connect with like-minded individuals and research your local building codes and zoning regulations. Join or start a local Meetup group. Plus, join the Tiny House People Facebook group. + Who are social entrepreneurs? Community-makers? Inspiring people working to make a difference in their communities. Our own definition of a community maker: social good promoter, creative thinker & doer who works to make a positive impact in his or her community via active collaboration with others (neighbors, like-minded individuals, community organizations, etc.). Meet a couple such folks from Tiny Houses Greensboro on our blog. When we talk about social entrepreneurs, we mean folks (individuals or organizations) who create innovative solutions to pressing social needs. They identify resources & creative solutions to tackle these issues. + Did you build your tiny house? Are you selling tiny houses? We built our own tiny house to live in it as our full-time home & to travel with it. No plans to build & sell tiny houses for others. We'll lend a hand if we can, or answer questions. Contact us! Our tiny house on wheels was built primarily by us, about 85% us, with generous help & support of our sponsors and friends. Our good friend and sponsor, Thomas E. Elsner Custom Carpentry, provided us invaluable support through mentorship and hands-on craftsmanship in a few of the more challenging aspects of the build. See inside our tiny house here! For more on our build, click here. + How much does it cost to build a tiny house? It varies. There are all kinds of factors including the size and are you going to build it all yourself, have some professional help, buy a shell, use salvaged & reclaimed materials, etc. The average cost of DIY build, general estimation based on research from various sources, $27,500. It can cost anywhere between $7,500 and $65,000. Skill, level of customization, quality of materials, tricked-out features like solar power, etc., all contribute to cost. As of our estimation right now, our tiny cost $20,000 in materials and a little labor help (give or take a couple grand), this includes the value of donated materials and labor. Doesn't include about a 1,000+ hours of pure sweat equity that went into our tiny home! To every region of the United States and parts of Canada—oh boy! Tiny house communities are popping all over the place, and we aim to visit & document as many as we can. Stay tuned! Destinations added to our map as we go. + Why are you doing this project? This is a passion project. We’re in it for the social good aspect, life experience & the incredible storytelling potential. There’s power in storytelling, and our goal is to contribute to a ripple effect of positive change in the housing landscape. It’s all about living small to create more abundance, on personal & community levels. We seek to help with the mainstreaming of tiny houses, a broadening of the modern housing spectrum. More quality tiny/small options are needed & desired. We want to feature those communities making it happen and inspire more communities to follow suit. Number 1, we are storytellers AND advocates for creative solutions to create more sustainable, quality housing and more connected communities. Number 2, we believe that more connected communities create a happier, healthier living environment AND a sense of home for all their members. The underlining purpose: Spark community conversation, share resources & inspire positive community building to create more micro-housing projects, providing an economically & environmentally sustainable housing solution for all. More on this here. • To inspire & empower individuals and communities to investigate & pursue alternative, fill-in-the-gaps housing solutions to create more quality, affordable housing options. • To inspire individuals to live smaller & more consciously as a means to create more abundance (more freedom, more financial stability, more connection with nature & community, more environmental sustainability). Our Mission: To inspire & empower people to think big & build small through our documentary storytelling and direct community engagement. + What is Living Tiny, Legally and how does it differ from your larger documentary project? It’s wonderful co-production born from our collaborative relationship with Kai Rostcheck of I Love Tiny Houses, Tiny House Lending & Tiny House Dating. We met at the Tiny House Jamboree and made a powerful connection over our shared passion for tiny housing and helping others achieve their tiny house dreams. Living Tiny, Legally seeks to legitimize conversations about legal Tiny Housing and to provide a proactive, illustrative resource for those seeking to bring tiny houses to their city but don't know where to start. This documentary will feature case studies; exciting examples of how a handful of cities from all over the country are making legal tiny house communities a reality. For our larger documentary series, we will be visiting 30+ tiny house community projects of all kinds, from tiny house villages for the homeless to educational projects, creative applications of micro or tiny housing to provide more affordable housing and more. This is more expansive project focused on the big picture of the tiny house movement, including the legal side but more focused on the tiny house enthusiast, developer, leader, activist, etc. + What does home mean to you? A sense of community. A feeling of belonging and security. A place of your own, where you can be your best self. + What kind of events do you hold? How can I schedule a #tinyx event? As we travel we'll hold the following events: tiny house open houses, community roundtables, neighborhood potlucks & listening parties, to directly engage folks on conversations about thinking about housing differently in a fun, entertaining way. Please email us at info@tinyhouseexpedition.com to schedule an event. + Are you a nonprofit? Tiny House Expedition is a fiscally sponsored project of Fractured Atlas, a non-profit arts service organization. Contributions for the charitable purposes of Tiny House Expedition should be made payable to Fractured Atlas and are tax-deductible to the extent permitted by law. You can help by making a tax-deductible donation today. This will help us reach our documentary subjects in communities across the country. Over 16,000 miles of road ahead... every tiny bit helps! Tiny house parking offers and select material donations are greatly appreciated as well. See our Donate page. Please share our website, blog & social pages. Like & follow us on your favorite social media site. + I want to learn more! We’ve bookmarked many of our favorite thought-provoking and inspirational stories on our on Pinterest page. 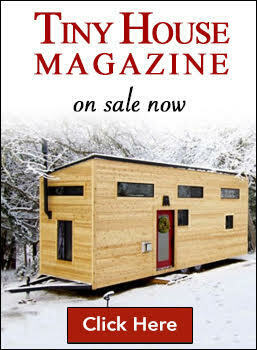 Includes a plethora of tiny house inspiration & helpful resources from the greater tiny house community, too! Have a question that we didn’t answer? Please email us at info@tinyhouseexpedition.com or complete the form below.